A recurring or repeating event is simply any event that you will occur more than once on your calendar. Rather than creating an event multiple times, you can use the Repeats menu, which built into the event editor. 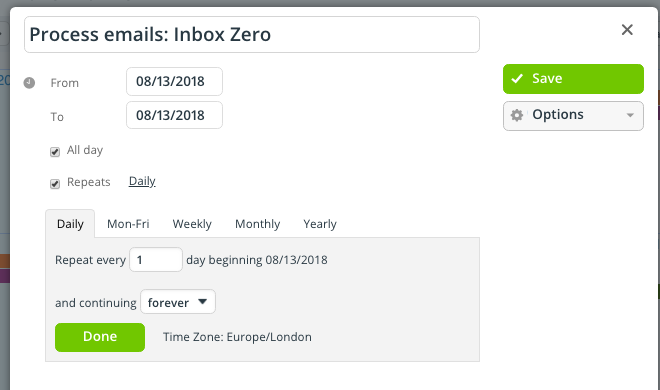 You can create and customize recurring events for many different timing and recurrence needs. Daily can be set to every day, every other day, every 3 days, etc. Weekly can be set to every week, every 2 weeks, every 3 weeks, etc., and to selected days in the week. Monthly can be set to every 2 months, every 3 months, etc., and set to a particular day: 10th day of the month or 2nd Monday of the month. Yearly can be set to every year, every 2 years, every 3 years, etc., and to a particular day, like the Monthly option. To create a recurring event in your calendar, click on the date you want the first instance of the event to occur. When the event editor opens, enter the event title and other details. Then check the Repeat box. The options for repeating events will open, and you can customize the repetition as needed. The built-in options for a recurring event. Recurring events are also supported on Teamup mobile apps. The Signups feature can be used to sign up for a single instance of a recurring event. When you make changes to one instance of a repeating event, you will be prompted to choose whether your changes apply to that instance only, to that instance and all future instances, or to all instances in the event series. If you want to duplicate an event, but not create a recurring event series, you can use the Copy event function. « What is the calendar administrator?